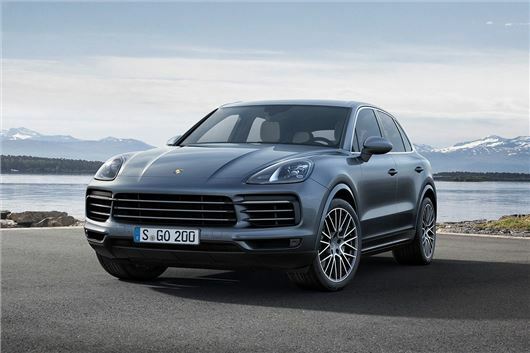 The all-new Porshe Cayenne has been revealed at the 2017 Frankfurt Motor Show. Based on the same platform as the new Audi Q7 and Bentley Bentayga, the new car is available to order now and costs from £55,695, with first deliveries due in early 2018. Click above to see a video overview. From launch there are two petrol options, both linked to an eight-speed automatic transmission. The standard car uses a 3.0-litre turbocharged V6 with 340PS, plus there is an S with a 2.9-litre twin-turbo, producing 440PS. No diesel engine has been announced, but there’s a good chance we’ll see a plug-in hybrid before too long. Inside, the new Cayenne has a very similar layout to its predecessor, but with touch sensitive controls replacing the masses of switches sprinkled haphazardly in the old car. There’s also a huge touchscreen system for controlling features like audio streaming and navigation. There’ll be plenty of safety tech, including adaptive cruise control and lane keep assistance, as well as automatic parking. There’s all-wheel drive too, obviously, along with a new and improved air suspension system to keep handling neat and motorway drives comfortable. Expect plenty of customisation options and extras, including upgraded audio systems, a variety of leather colours and finishes and several different inlays and material choices for the cabin. You can also get the Sport Chrono Pack to improve your 0-62mph time and add more driving modes.